Race day began before sunrise, which suited Jean Mellano; she couldn’t sleep anyway. Dark clouds hovered over the North Fork and the whipping wind signaled less-than-ideal conditions ahead. Ms. Mellano had been through the drill many times before, always at the side of her life partner, Steve Tarpinian, on the morning of a triathlon. Mr. Tarpinian, a swim coach and triathlete, was well known across the East End as the brainchild of local races including the Mighty Hamptons Triathlon and the Mighty North Fork Triathlon. On race day, Ms. Mellano worked behind the scenes, assisting Mr. Tarpinian as needed, whether it meant bringing water to the finish line or directing traffic. Through all the years and different races, she had only participated herself a handful times as part of a relay team. Yet there she was Sunday morning, icy pellets of rain striking her face as she raced from Cedar Beach through the quiet streets of Southold, mostly by herself as she passed inspirational quote signs Mr. Tarpinian had created. 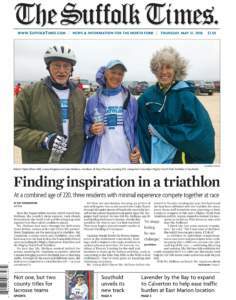 So how did Ms. Mellano, age 64 and battling Parkinson’s disease, decide this would be the time to race her first triathlon? That story begins several months earlier at Peconic Landing in Greenport.